Yes, ITV have (not) kept it quiet but this week, Britain’s Got Talent explodes back onto our screens – and once again looks set to considerably trounce The Voice. For the first time in a few years, the judging panel has not changed: David Walliams, Alesha Dixon, Amanda Holden and, of course, Simon Cowell are all returning to offer their verdicts on some of the nation’s most weird and wonderful acts – including three artistic donkeys and a dancing racoon. However, it looks like we’re not going to be finding the next Ashley & Pudsey (last year’s victors) this year. Alesha Dixon claimed that the animal acts (and yes, believe it or not, I am including the aforementioned donkeys and racoon) were ‘useless’. However, even without dancing dogs and crooning cats, we still have the usual batch of human singers and dancers to look forward to, no doubt. Plus, the first episode also features Jack Carroll – a cerebal palsy sufferer who amazes the judges with his self-deprecating jokes. It’s worth a watch! Also today: BBC2 airs a celebration of Are You Being Served? with The Story of Are You Being Served? (5:30pm) and then an episode from the tenth series of the sitcom (6:30pm); The Voice UK limps into its third episode (BBC1, 6:45pm); Stephen Mulhern returns with Britain’s Got More Talent (which, dare I say it, I see as just as good as the main show) on ITV2 at 8:35pm; Forgetting Sarah Marshall (see Friday) spin-off Get Him to the Greek is on Channel 4 at 9:30pm; and Julian Clary, the Made in Chelsea cast and Martin and Gary Kemp join Jonathan Ross for a new episode of his chat show (ITV, 9:35pm). Following last year’s successful pilot, Shaun Evans is back in the prequel to Inspector Morse. This episode sees Margaret Bell, a young student, suddenly die in her home. The cause of death is announced as a heart attack, but Morse suspects that this is not true and begins trying to prove so. However, owing to his unorthodox views, the nation’s favourite Inspector has been relegated to General Duties, which means that solving his cases may be slightly more difficult than it originally appeared. Also today: Julia Roberts and Susan Sarandon star in the moving Stepmom (Channel 5, 5:00pm); Stephen Mulhern’s Catchphrase continues on ITV at 6:45pm (and if we have anyone like last week’s contestant, Hazel, we’re in for another treat); Jo Brand and Meera Syal finish their game on nail-biting gameshow Five Minutes to a Fortune (Channel 4, 7:00pm – 5:00pm weekdays); the Traveller economy is revealed in My Big Fat Gypsy Fortune (Channel 4, 9:00pm); Paul O’Grady profiles a Gypsy of another kind on ITV at 10:00pm: Gypsy Rose Lee is the focus of this week’s Perspectives; comedy film Juno is on Channel 4 at 10:00pm; and, finally, Tom Cruise stars in 1998 film Cocktail (Channel 4, 11:50pm). The series which aims to help a number of the country’s biggest hoarders returns. In this episode, the team help Alison, whose £40,000 collection of ladybird-related items is affecting her relationship with her boyfriend, Sam. Also being aided to de-clutter their house is Jo, a primary school teacher whose house is falling down around her because of her large collection of toys and books. Stelios Kiosses and his team attempt to rid Alison and Jo of their excessive hoards – but will they succeed? Also today: Rory Bremner’s Great British Views begins with a visit to The Lakes (ITV, 2:00pm); following its postponement last Monday, to make room for a documentary celebrating the life of Margaret Thatcher, the first episode of The Prisoners is broadcast (BBC1, 9:00pm); and ITV’s gripping Broadchurch reaches its penultimate episode (9:00pm). Tucked away in a post-watershed slot, this one-off documentary sees HRH The Prince of Wales trace his family’s artistic roots. Along the way, the Prince reveals some Royal artworks, from past and present, as well as some of his own creations. Also today: Tonight focuses on Stephen Lawrence, the black teenager who was murdered twenty years ago this month (ITV, 7:30pm); Secrets of the Shoplifters follows South Yorkshire’s undercover retail police in the run-up to last Christmas (Channel 4, 9:00pm); and The Matt Lucas Awards, postponed from Tuesday 2nd April, is on at 10:35pm. 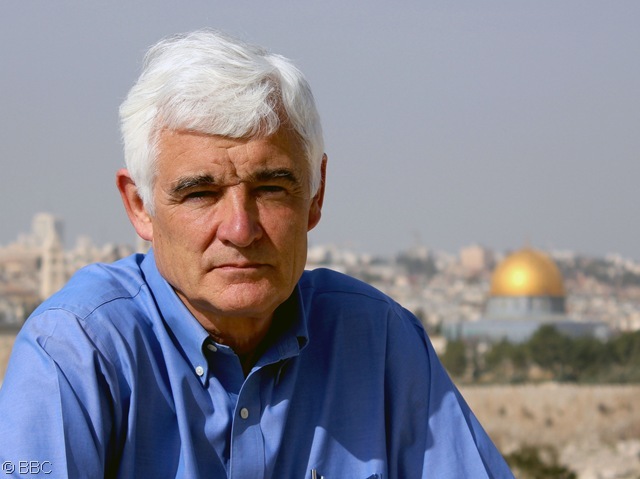 Panorama’s John Ware (pictured) explores Israel in this documentary, discovering how the people have reacted to the changes they face as a result of the Arab Spring. Ware speaks to Israelis during the programme and analyses what the only Jewish state in the world is soon to face. Also today: David Dimbleby presents coverage of The Funeral of Baroness Thatcher (BBC1, 9:15am); Matt Edmondson returns to narrate some more Totally Bonkers Guinness World Records (ITV2, 8:00pm); and we delve into the work of eighteen-year-old Luke Thomas, who is Britain’s Youngest Head Chef (BBC3, 9:00pm). Renowned animal lover Paul O’Grady hosts the Pride of Britain of the animal kingdom as he celebrates the achievements of pets and their owners in this special ceremony. Paul has taken some time out from the filming of the second series of his award-winning documentary (or ‘dogumentary’ – thank you! ), For the Love of Dogs, to host the first British Animal Honours ceremony. The categories range from The Ray of Sunshine Honour, to The In the Line of Duty Honour, and The Internet Star Award – which has been voted for via the ITV website and will be presented by last year’s Britain’s Got Talent winners, Ashley and Pudsey. There aren’t just the awards to look forward to, either: the two hour-long ceremony also includes performances from War Horse and the South Wales Police Dog Section – and probably the odd appearance from one or two members of Paul’s own pet collection. Also today: couples discuss their lives in It’s Love, Actually (Sky Living, 8:00pm); and Maureen Lipman tries to earn herself “an –ology” (sorry!) in If Memory Serves Me Right, which sees her explore how the mind works, and what we can do to enhance it (BBC1, 9:00pm). This three part drama series, based on Dorothy Koomson’s novel of the same name, stars Lorraine Burroughs and Jodhi May as two women who, in 1995, were accused of murdering their teacher, Mr Halnsley. As Poppy (May) is released from her seventeen-year prison sentence, still adamant that she did not commit the murder, Serena (Burroughs) is forced to think about the things which she for so long has tried to put out of her mind. Serena once had an affair with Mr Halnsley but, when he was murdered, it ended abruptly – as it naturally would… Now, Poppy and Serena return to their hometown and begin to try and atone for their involvement in Halnsley’s death seventeen years previously. Apparently, The Ice Cream Girls is so-called because that’s the name the press gave Poppy and Serena at the time. I don’t know exactly why they were given that name, but it clears up my confusion just a little bit. Also today: I don’t know whether they’ll have as much to talk about than last week but Warwick Davis is in the chair for Have I Got News For You (BBC1, 9:00pm); the second episode of 8 Out of 10 Cats Does Countdown sees Lee Mack, Richard Osman, Stephen Mangan and Jon Richardson all compete (Channel 4, 9:00pm); Bobby Ball pops up again as Lee’s dad in Not Going Out (BBC1, 9:30pm); Bill Bailey, fun. and Jennifer Saunders are guests on Alan Carr: Chatty Man (Channel 4, 10:00pm), which looks set to be around until at least 2015; Jason Segel and Russell Brand star in Forgetting Sarah Marshall (ITV, 10:35pm); and Gwyneth Paltrow and Lee Mack (who’s had quite a busy night!) are on Graham Norton’s sofa (BBC1, 10:35pm).